Product Details - Material- Rope , Suitable -Large Breed, Size- 4 Inch, Dimensions - 11 cm, Colour- Attractive in color, Use-Fits in the mouth easily. Product Information -Great Interactive Toy. Aerodynamic Design For Long Power Kicks and Exciting Retrieves For Your Dog. 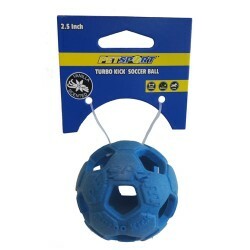 Cut Out Design Allows Your Dog To Easily Pick It Up. Durable, Great throw. Ultra light, ultra strong, ultra bounce Durable and puncture resistant.